The Form No. LLC-1 - Minimum Wage Law Poster and Fact Sheet is a minimum wage law poster by the Pennsylvania Department Of Labor & Industry. This is a mandatory posting for all employers in Pennsylvania, and businesses who fail to comply may be subject to fines or sanctions. 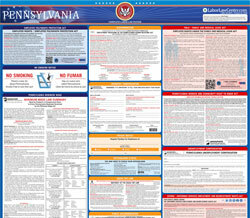 This mandatory poster specifies the Pennsylvania minimum wage rates that apply to regular employees, tipped employees, and other employees who may be exempt from normal minimum wage rates. Also includes information about overtime laws applicable in PA. It appears you don't have a PDF plugin for this browser. Please see the link below to download pennsylvania-llc-1.pdf. Department of Labor & Industry. workweek are devoted to such activities. classification. The wages, including food credit plus tips, must equal the current minimum wage. Board:	 Food furnished in the form of meals on an established schedule. Fair Labor Standards Act from the U.S.
to 	frequently asked questions	 and read more about the Minimum Wage Act.